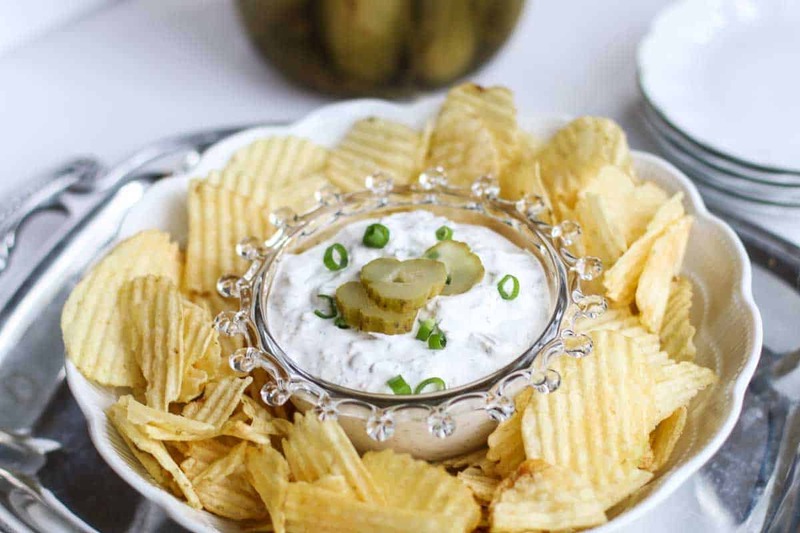 This easy, delicious Dill Pickle Dip Recipe is a home run for pickle lovers. 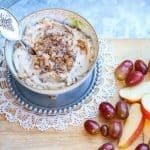 Cream cheese and sour cream is mixed in with chunks of dill pickle to create a tasty low carb vegetable dip, chip dip, or pretzel dip. If you love the taste of a sour, crunchy dill pickle; you are going to LOVE this Dill Pickle Dip Recipe. I make this for parties, back yard barbecues, or movie night ins for our “movie snacks.” It usually disappears in seconds. I love, love, love a good dill pickle. Growing up as a child, I was one of those kids that preferred dill pickles over candy. My mom would buy a jar of pickles and my greedy little self would eat the whole jar in just a few days. If we were traveling, I would beg her to buy me one of those enormous pickles that were sold at the Quick Stops that came in a plastic pouch or in one of those big gigantic jars of pickles. When we ordered hamburgers at a restaurant, I would have to have extra, extra, extra pickles…. The saltiness, the sourness, the crunch…. Yum! I still love a good dill pickle. I also love chips and dip…. And so, it only made sense to combine two of some of my favorite things. When I make this dill pickle dip, I have to double it. I put one batch out for my kids to destroy. It is usually gone in seconds. Then I put out my second batch when they leave the kitchen, ha! ha! I have to sneak it in so I can get a little also. It is AMAZING on some salty ridged potato chips. But if you are being good and healthy (as we all should be), it is also great on your favorite veggies. 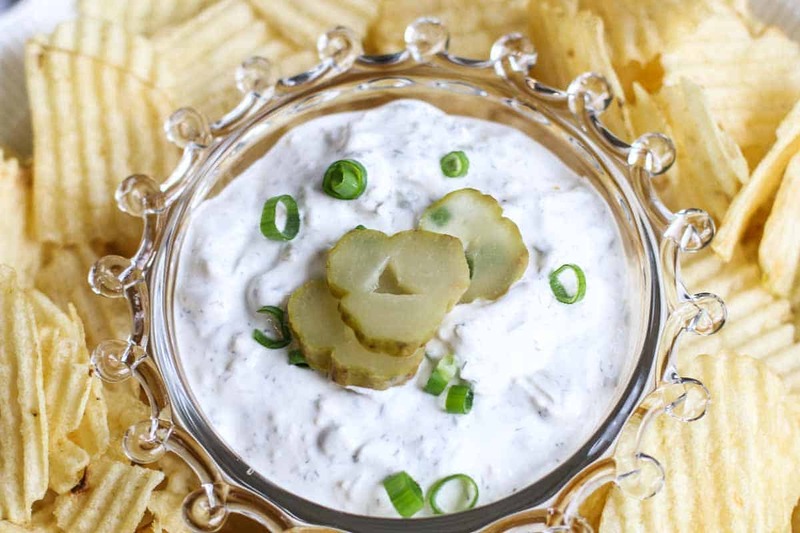 This Dill Pickle Chip Dip Recipe only takes a few minutes to make. When I am lucky, I have my Uncle Danny’s homemade pickles and I use them to make this recipe OVER THE TOP. No one makes pickles better than my Uncle Danny. So if you have some homemade pickles, I highly recommend using those. But if you don’t, be sure to use a really good sour brand. The dill pickles really mix well with the sour cream and cream cheese. Pucker up and Enjoy!! 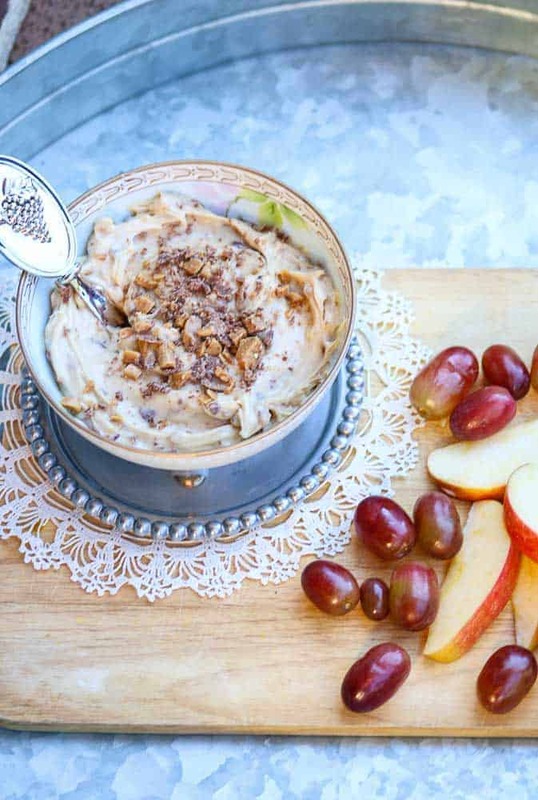 If you like this recipe, check out: Candy Bar Cream Cheese Fruit Dip, Homemade Chunky Blue Cheese Salad Dressing, and Jalapeño Cilantro Hummus. 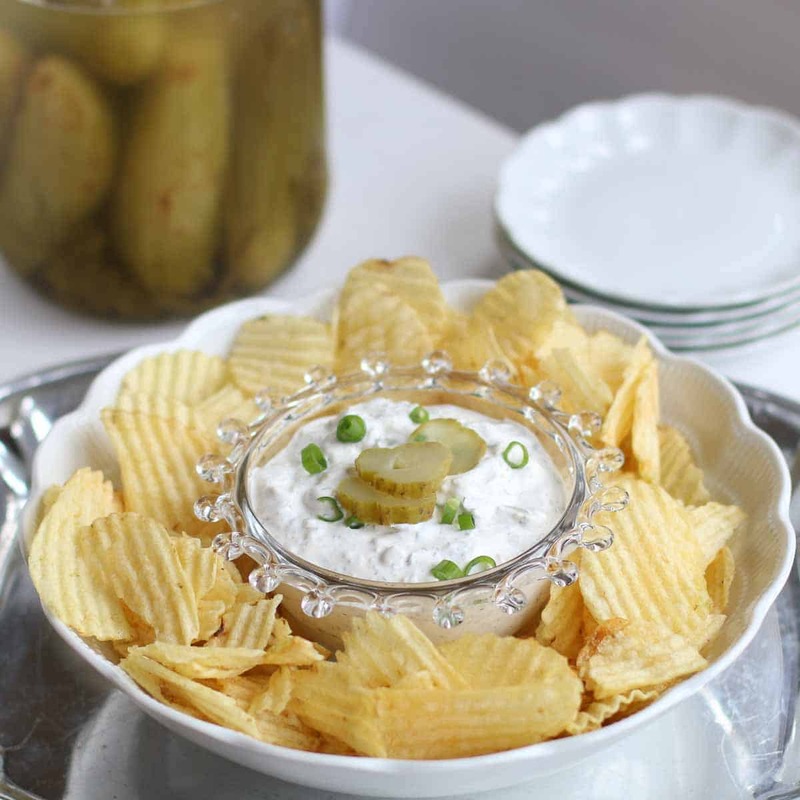 If you love the taste of a sour, crunchy dill pickle; you are going to LOVE this Dill Pickle Dip Recipe. It is great on chips, veggies, pretzels, and crackers. Warning: You might want to double the recipe. It usually disappears in seconds. Combine first cream cheese, sour cream, and pickle juice until smooth. Chill in refrigerator for one hour or more before serving. This looks fabulous and those flavors are amazing! Will be giving it a try soon! I gotta make this!! For real!! I love pickles so much!! I was surprised by how much I liked Dill Pickle Dip when I bought it – I hadn’t even thought about making my own! What a great idea – this looks delicious! My tastebuds are totally tantalized – I’m going to have to make this soon! Looks awesome – I love pickles! This. Is. AWESOME! My family is absolutely crazy about pickles – pinned! Pickle dip reminds me of what we call pretzel dip. Almost all the same ingredients and I love it. That means I am going to love this one too. I love pickles. And your addition of pickle juice is a great idea. What a cool way to add the pickle flavour, I never even thought of that. Oh Katie, this sounds rockstar delicious as I`m a huge fan of pickles!! Having friends over for dinner & this just got added to the menu! !